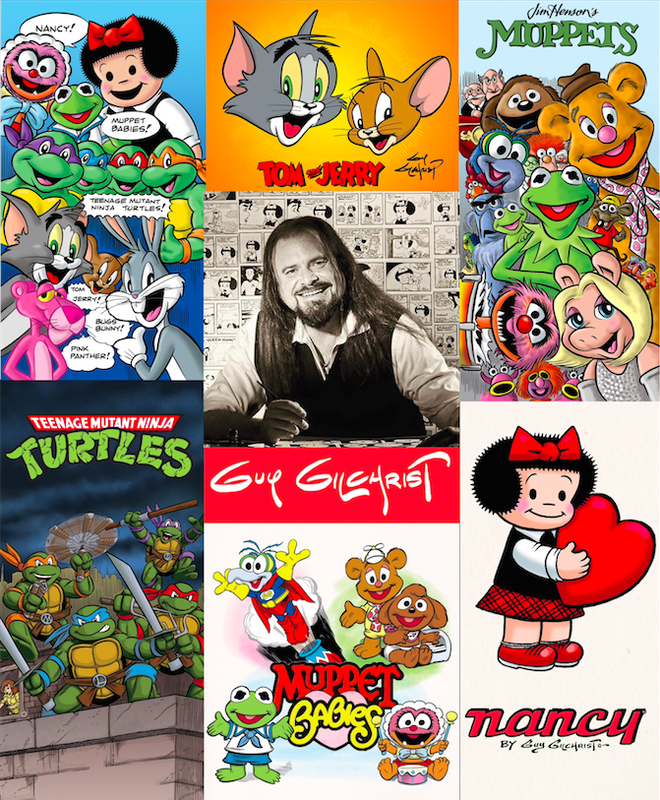 "Muppet Babies" Artist, GUY GILCHRIST! Available for 2017 Bookings! Guy and a few of his friends. Guy Gilchrist, at the age of 24, was hand-selected to create Jim Henson’s Muppets Comic Strip that was printed worldwide in 660-plus newspapers daily from 1981 to 1986. Throughout the years, he has set his hand to such notable cartoons as The Teenage Mutant Ninja Turtles, Looney Tunes, Tom & Jerry, Tiny Toons, Jim Henson's Fraggle Rock,The Pink Panther, Minnie Mouse, and was instrumental in the creation of The Muppet Babies! Gilchrist has been recognized and honored internationally for his creativity and authorship. He was awarded the National Cartoonist Society's highly coveted Reuben Award in 1997 and again in 1998 for Best Magazine and Book Illustrator, for Night Lights and Pillow Fights – Book One and Book Two. Also for Night Lights and Pillow Fights, he was awarded the Bank Street Award for Best Book of the Year – 1998. He is a three-time award winner of the Best Book of the Year from the International Reading Council of the United Nations, for the Tiny Dinos book series. The Tiny Dinosseries was among the top bestselling books at Walden Books. A strong supporter of charities and children, Gilchrist has been honored for his contributions by Vanderbilt Hospital, St. Jude Children's Research Hospital, Hartford Children's Medical Center, Shriners Hospitals, and The Angelus. An active supporter and voice for the military and veterans’ causes, Gilchrist has been honored by the armed forces and veterans organizations for his support and work. Guy lives in Nashville, Tennessee with his beloved Anna, when they are not touring America and the world. We are so pleased to be offering Guy for 2017 bookings, and welcoming his positive attitude and professionalism. I know you'll appreciate him as well.